KABUL, Afghanistan (AP) — Hundreds of Afghans blocked a major highway south of Kabul on Tuesday, carrying freshly dug-up bodies they claimed were victims of torture by U.S. special forces and demanding the Americans be arrested, officials said. A spokesman for the U.S.-led military coalition said the claims are false. Violence erupted at the rally and two of the demonstrators were killed but the cause of their deaths was unclear, said Mohammand Hussain Fahimi, a provincial council member in Wardak, 45 kilometers (27 miles) south of Kabul. The three bodies were dug up earlier on Tuesday morning near a former U.S. special forces base in Nirkh district, according to Attaullah Khogyanai, the provincial governor's spokesman. Six other bodies were unearthed there in the past few weeks. Khogyanai said an investigation was underway but that it was too soon to say if the three were among at least nine people who villagers say disappeared into American custody and were never seen again. U.S. special forces withdrew from parts of Wardak earlier this year at the insistence of Afghan President Hamid Karzai, following alleged torture, kidnapping and summary execution of militant suspects there — charges U.S. officials have firmly denied. Tuesday's rally brought a car with the three bodies to the local provincial governor's office, then protesters fanned out and blocked traffic on the main road from Kabul to Kandahar, said Fahimi, the council member. "They were throwing stones and shouting against the government and the (American) special forces, saying, 'We want the killers of these innocent civilians to be prosecuted,'" Fahimi said. The demonstrators tried to get into the governor's office, and police fired in the air to stop them, he said. He added that at least two protesters were killed but he was unsure if they had been shot or trampled. The U.S. has repeatedly denied accusations that people arrested by special forces in Wardak province died in American custody. However, villagers accuse the Americans and their Afghan partners of intimidation through unprovoked beatings, mass arrests and forced detentions. "We are absolutely confident, based on the investigations that we have done, that neither U.S. nor coalition forces were involved in any unlawful deaths there," coalition spokesman Col. Thomas Collins said Tuesday. Also on Tuesday, the International Committee of the Red Cross said it was temporarily removing some of its staff from Afghanistan and curtailing some of its activities following an attack last week on its offices in the eastern city of Jalalabad, a spokesman said. 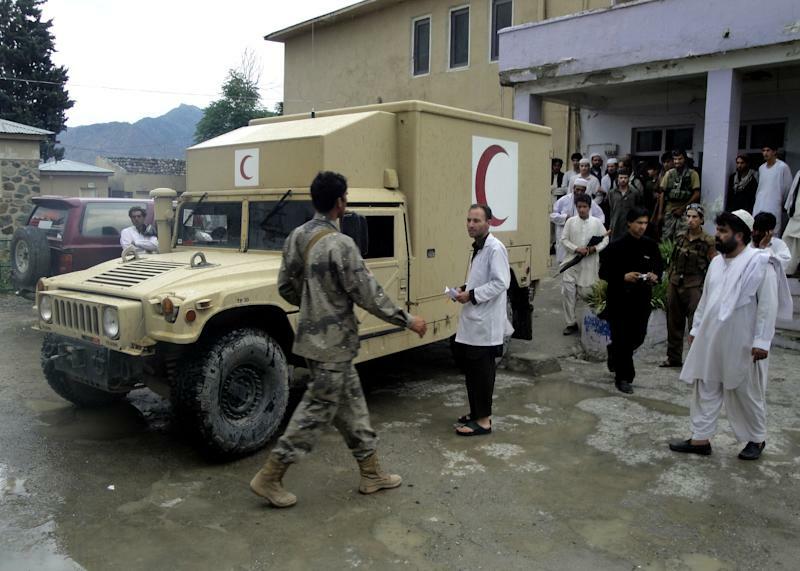 Robin Waudo, communications coordinator for the Red Cross in Afghanistan, said a decision on the number of international staff that would leave had not yet been made. He said the organization would continue with some of its services, including orthopedics — the Red Cross supplies many artificial limbs across Afghanistan — supporting Kandahar's largest hospital, and keeping families in touch with detainees. "We are doing this until we can analyze the situation," Waudo said. Last week, a suicide bomber detonated his explosives at the Red Cross compound's gate and another gunman burst into the complex. An Afghan guard was killed in the explosion, and seven international staff inside the compound were later rescued by police. The attack was the second in a week targeting aid groups in Afghanistan, raising worries that insurgents now consider humanitarian workers as prime targets along with international and Afghan security forces. It remains unclear who attacked the Red Cross. Two days after the attack, The Taliban made a rare public denial that they were responsible, saying they had previously cooperated with the organization and did not support targeting it. 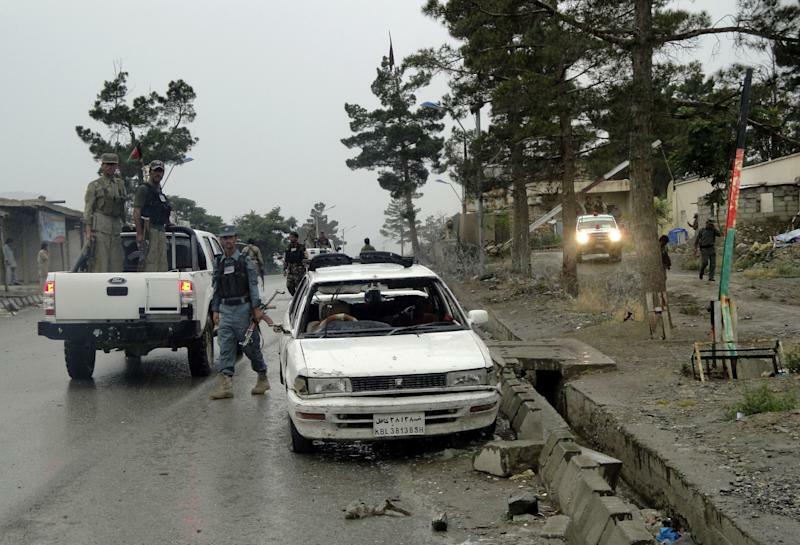 Also Tuesday, an Afghan family's car struck a bomb buried in a road in the country's west on Tuesday and the father and three children were killed, an official said. They were the latest deaths in a sharp rise in civilian casualties amid a fierce wave of insurgent attacks. The father and children were killed instantly, and the mother was critically injured in the explosion, said Abdul Rahman Zhawandai, spokesman for the western province of Farah. 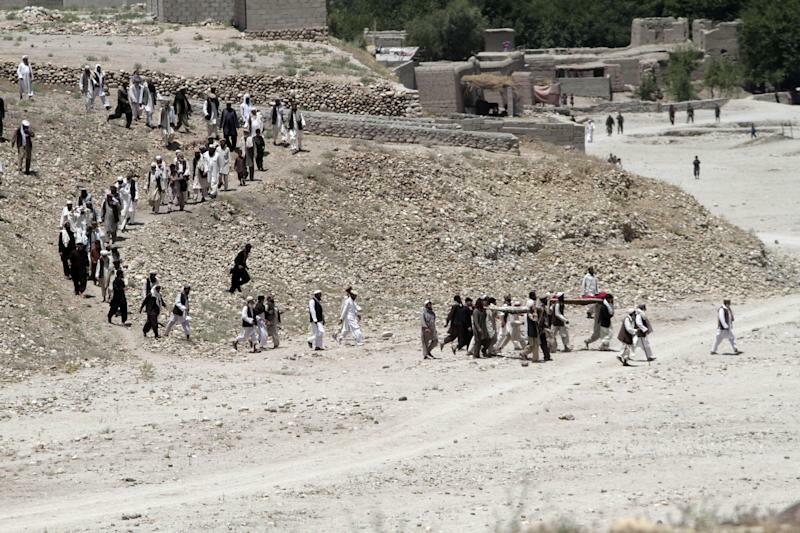 Another buried bomb killed seven more people on Monday in the eastern province of Laghman. The same day, a suicide bomber targeting American troops in Paktia province killed nine Afghan children who were walking home from school nearby, as well as two of the Americans and an Afghan police officer. Civilian casualties have soared in recent weeks as the Taliban and other insurgents attack around the country to test the Afghan security forces, now that international troops have stepped back in preparation for the withdrawal of most next year. In just the past two weeks of the escalating spring offensive, violence has killed or wounded 412 Afghan civilians, up 24 percent over the same time last year, the U.N. said Monday. It blamed insurgents for 84 percent of those deaths. The Taliban have repeatedly said they avoid killing innocent Afghans, but statistics kept by the United Nations show most civilian deaths are from insurgent attacks. In southern Helmand province, six people — three women and three men — were killed on Tuesday when a bomb planted inside one of their homes detonated. The bomb was apparently planted by insurgents who had been fighting government forces in the Maulaza area a day earlier, provincial spokesman Ummar Zawaq said. The six, members of two families, had fled the fighting and returned to their home. Associated Press writers Kay Johnson and Patrick Quinn contributed to this report.